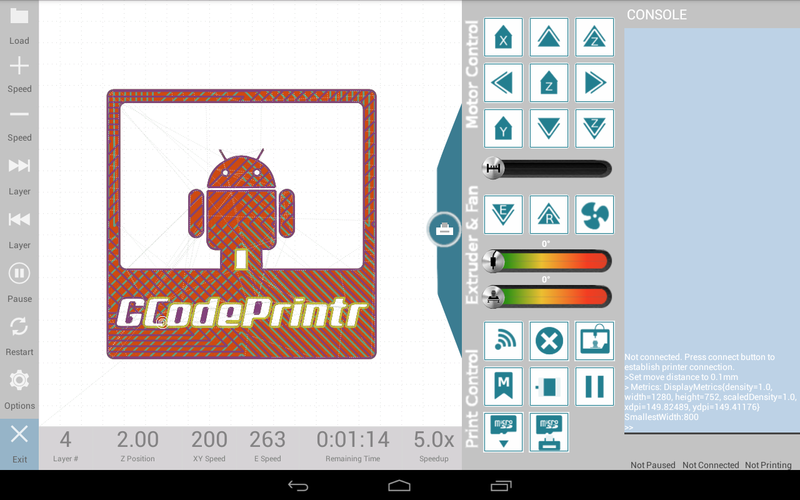 GCodePrintr is an App for the mobile Android operating system to control 3D printers. Today 3D Printers usually get controlled by a PC using a USB connection. Many PC tools are available to control 3D printers (like Printrun, Cura, Repetier Host, Octoprint). With GCodePrinter one can easily control 3D printers using the touch screen of an Android phone or tablet, and no longer need a PC. The Android connects to the 3D printer via USB, the device must have the USB OTG/Host capability in order to connect to any printer. Alternatively Bluetooth is supported a well , together with a serial bluetooth module for your 3d printer (e.g. JY-MCU) it can print wireless. Initially the App has been developed for Reprap 3D printers, but many commercial 3D printers use the same G-Code based communitcation protocol. Therefore the App works with most available 3D printers (incl. Reprap, PrintrBot, Ultimaker, Makibox, Solidoodle, Robot3d, Multec Multirap). All essential functions can be controlled though the touch screen interface, this includes manual X/Y/Z movement, Fan control, Temperature control, Extruder forward/reverse, Homing, Adjust printing speed and manage the SD Card content for printers with SD Card slot. There is even a experimental function to control the print head using finger wipes on the touch panel. Once the GCode file is loaded , the App starts a simulation of the print process by painting the 3D model layer by layer to show how the print will progress. Each layer is painted in a different color to see how a layer overlaps with the layer below. A side view and a front view of the model is painted as well. Also, based on the parsed gcode results, the App calculates some very interesting informations like amount of filament needed, estimated cost, weight, print duration and more. This allows you to check how your print should turn out, making it easier to spot errors and fix them instead of wasting filament. The slicer step still needs to be done on a PC using Skeinforge, Sli3r or other tools. There are many ways to copy the gcode to the Android App, either by using 3rd Party apps like Dropbox, CIFS client, file explorer or by using the build in network receiver which listens for incoming gcode files. Sending gcode files to the app can simply be added as a slicer post processing script to automate the send once the slicer is finished. A simple web interface allows you to view the print status in a remote browser or to watch the video stream of the build in Webcam. All together, the gcode visualization and the printer control, nearly makes it a full-fledged replacement for the PC host software. Its main strength are: good mobility, low cost, low power consumption and reuse of old discarded Android devices. GCodePrintr is currently the only Android App for 3D Printing with full functionality, it is available NOW in Google Play Store. GCodePrintr can load gcode files from the Android devices internal storage, sd-card or even dropbox folder. To do this you need to install an Android file manager (e.g ES File Explorer). Once the gcode file is loaded, it can be printed directly from the Android device. No PC is needed. If you have a SD Card reader in your printer, GCodePrintr can upload gcode files from the Android devices to the SD Card inside your printer (SD streaming). It can list files on the SD card and choose one for printing. The printer will print directly from SD card, GCodePrintr will report print status (percent complete) during SD card print, but in fact the android device is not needed during the print and can be turned off. GCodePrintr supports user defined macros (series of gcodes).Users can define up to 9 macros (e.g. for bed leveling, filament change,..) and store it for later user. The macro execution dialog lets you easliy choose between your macros and execute them quickly. 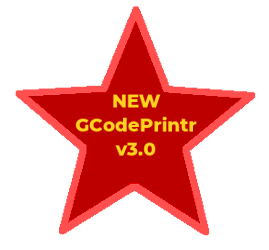 GCodePrintr allows to adjust the print speed while printing (using M220 gcode). Increase or decrease the print speed with a single touch. Long press on speed+/- will adjust the extrusion rate (M221 gcode). GCodePrintr can visualize Gcodes and also simulate a 3D print. Instead of painting the model at once it is painting layer by layer to show how the print will progress. Each layer is painted in a different color to see how a layer overlaps with the layer below. A side view and a front view of the model is painted as well. All together allows you to check how your print should turn out, making it easier to spot errors and fix them instead of wasting filament. GCodePrintr can connect to bluetooth enabled 3D printers. Any Reprap printer based on RAMPS can easily be extended to support bluetooth by connecting a JY-MCU module. See FAQ. GCodePrintr can listens for gcode files received over any TCPIP network. Once enabled, by long-press the "load" button, it will listen to port 53232 for connections. Use Gcode Simulator for PC (>V1.07) to send gcode files from PC directly to your Android tablet to print them. GCodePrintr supports loading gcode files from Dropbox, Google Drive or other cloud services. This allows you to store the sliced gcode files on your favorite cloud storage and load it into the App to print it. GCodePrintr can use NFC tags to store the printer related configuration. This allows you to easliy switch between multiple printer configurations just by holding your NFC capable device to the NFC tag. 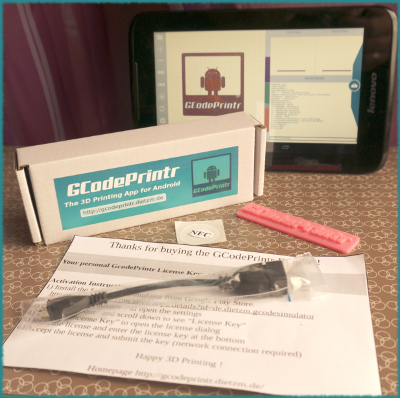 3D Printer manufacturers can now bundle GCodePrintr with their printers. Instead of shipping with a tiny LCD display, 3D Printer companies can offer a much better user interface when integrating a tablet. The GCodePrintr App can be customized and branded with your company logo. GCodePrintr can be a real differentiator for your 3D printer. GCodePrintr might also be interesting for 3D Print shop owners, to give a user friendly interface to their customers. Resellers can sell GCodePrintr Bundles which consist of a 1x GCodePrintr License key, 1x USB OTG Cable, 1x NFC Tag , 1x GCodePrintr Logo, 1x Simple phone stand.